A Blu-ray jukebox is designed to hold multiple Blu-ray writers that write BD discs these can have an archive life of 50+ years. The jukebox normally appears as a NAS and each BD disc represents a network drive letter. A typical Blu-ray jukebox could hold 100 BD discs of 100GB capacity, providing 10TB of long term archival storage, the largest systems can store PB’s of information. With highly reliable robotics the Blu-ray jukeboxes are designed to provide over 5 million BD disc removals. Unlike tape, if you write a BD disc in UDF 2.0 format or higher and a number of years later that disc needs to be read, all you need is a Blu-ray drive and operating system that can read the media. There are over 14 operating systems that support UDF including Windows Vista/7/8/10, Apple OS X, Linux. BD discs can be stored at normal room temperature and do not require any special handling as they have an extremely hard tough coat, that protects the media from scratches and damage. Blu-ray jukeboxes are available in multiple configurations, including “MixedMedia” options that provide for both DVD and Blu-ray media or even drives in the same jukebox. MixedMedia jukeboxes enable the easiest and most cost-effective migration path to Blu-ray for optical storage users. Many current optical storage customers are looking at alternative technologies for their data archive storage needs and the Blu-ray jukebox comes at a key time when government regulations and company requirements are requiring longer and longer archive retention periods, proof of authenticity as well as fast access to archived files. A Blu-ray jukebox is ideal for companies looking for higher capacity and faster access times at the lowest total cost of ownership. The jukebox can be provided as Network Attached Storage with the jukebox storage management software preloaded, or be supplied as a SAS attached system which connects directly to your server and storage management software. Many customers prefer the NAS option as it provides an easier way to integrate with existing infrastructure, easier updates and support. The smallest Blu-ray jukebox we provide is 10x 100GB BD discs rising to over 2,000 discs for large institutions. What is the life span for Blu-ray discs? Blu-ray provides backward read compatibility with all previous generations including CD/DVD/25GB/50GB/100GB Blu-ray media. It is designed to store archival data for 50+ years with very little human intervention or management. LTO tape is designed for 30 years, the issue is that unlike Blu-ray you need to constantly update your LTO drives every couple of generations otherwise they cannot read more than 2x generations back and also LTO needs to be kept in a monitored and air conditioned environment. Whilst disk capacities are now 14TB’s and by 2020 20TB’s, that is a huge amount of information to keep on a 3.5″ hard drive. A hard drive is designed to spin and work reliably for 5+ years if you buy enterprise drives and not desktop. Statistics have proved that if a hard drive fails it will fail typically within its first 1,000 hours of operation. If a customer purchases a removable hard drive, writes data, puts the drive on a shelf it probably wouldn’t have worked for more than 24 hours. A hard drive is designed to spin at a constant rotation, continuously, it is not designed to sit on a shelf for years. The issue is that the drive lubricants start to solidify and this causes stiction. You must continually upgrade to the latest LTO tape generation as it can only read the previous 2 versions i.e. LTO-7 can read LTO-5 tapes. Software vendors from time to time change the way data is written to tape i.e. data backed up 10 years ago cannot be read by the same software manufacturer. Different software vendors use their own tape format to write data i.e. if you change software vendors, none of your tapes can be read. The tape is a contact media, whereas Blu-ray is contact less. What happens when LTO-10 is the final release of the technology in the next 5-10 years? LTO tape is not classed as a “Tamper Proof Media”. You must use LTO WORM to meet this criteria. Identifying data and who owns it, how long it needs to be kept, does it need to be deleted, this is by far the most difficult task of all. Most businesses do not have a clear backup or archiving policy. Traditionally backup has been “back up everything and keep it forever”. Many of the backup software packages do not have an archiving component. Should you buy an integrated backup / archiving solution? What data protection policies are in place for people that no longer work in the business? 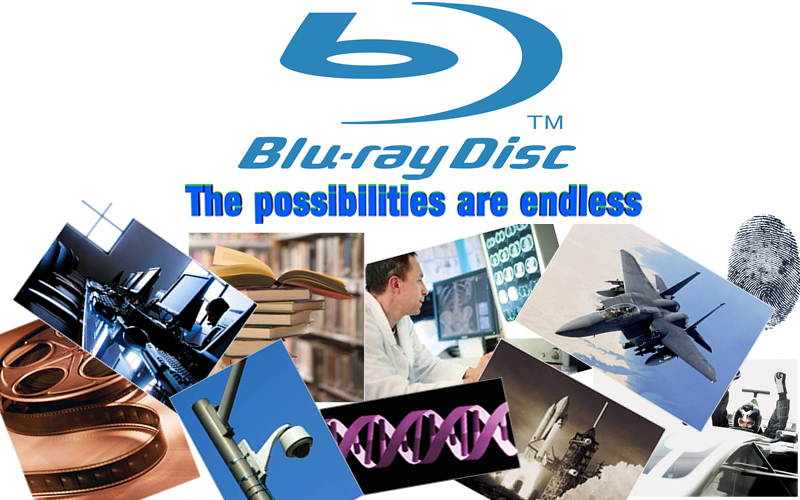 What companies are using Blu-ray? Businesses that understand the value of information, know when to use the correct archiving technology. The applications for storing long term information in “Cold Storage” i.e. infrequently accessed data is huge. Should you invest in a Blu-ray Jukebox Solution? If you want to remove the hassle and headache of moving information from technology A to technology B every few years for “Cold Storage”, then a Blu-ray jukebox makes sense. As mentioned previously a Blu-ray jukebox archiving solution is an expensive upfront cost, over the long term it will save money compared to other storage methods.